If you were of libertarian disposition, you may look at this chart and say “so what? Everyone is growing richer, but some are just growing richer faster.” I would be very reluctant to adopt such a stance. First, note that the differences between the bottom and top deciles are very small in annual percentage terms (0.5% against 1.4% growth rates per annum), but the magic of compound interest makes absolute differences explode over decades. 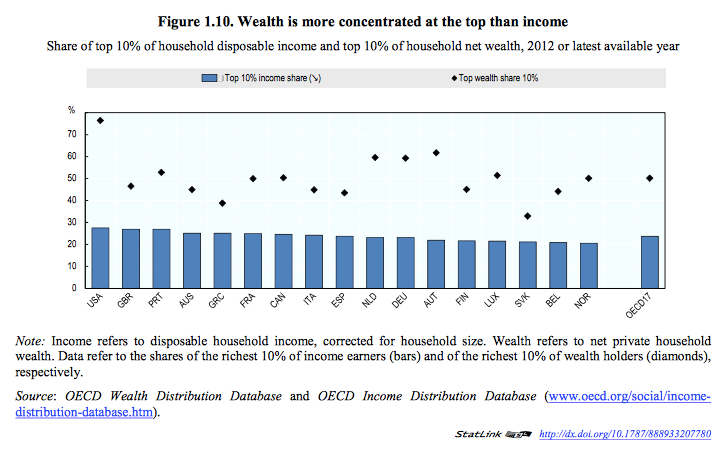 As the rich earn first 10 times, then 20 times, more than the poor, the lives of the two groups separate. Given that much consumption is positional; that is, its value is not in absolute but relative terms, low earners will grow increasingly resentful. Their status in society will fall; and, accordingly, their interest in maintaining current social and political structures will also weaken. Second, note that financial well-being is composed of income and wealth. And very high income translates into enhanced wealth. Part of this may be due to US political culture, including its tax system. But I also feel it is the result of the US being at the forefront of global technology-change-led capitalism. That means that what we are seeing is secular and not society specific. This assertion can be backed up by the fact that even Nordic societies are getting less equal. The US may just be where other nations are going. 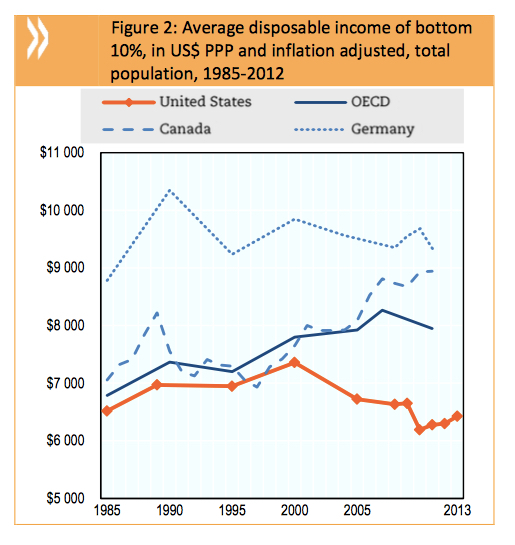 Unfortunately, the US also has one of the worst records for intergenerational mobility. Less than one in 10 born into bottom 20% families by income make into into the top 20% by income over their lives. That is about half the odds of many countries in northern Europe. So if you want to achieve the American dream, you have a far better chance outside of America. The only good news is that the situation is not getting any worse in the US–yet! A well-publicised NBER study last year (summary here), showed no decline in US mobility. 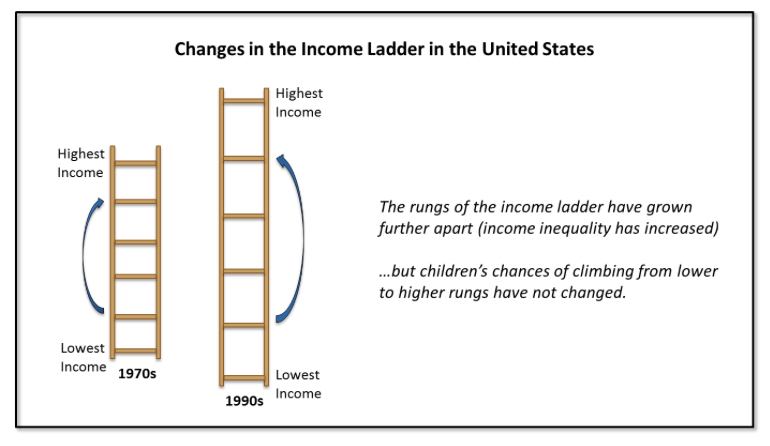 The ladder is growing elongated but movement up and down has not changed much in recent decades. I am not sure how long this will last. My own experience of growing up and then raising a family in the UK is that lives are getting a lot more segregated by wealth. Scott Fitzgerald writes in his story The Rich Boy “Let me tell you about the very rich. They are different from you and me.” I don’t think they are different, but increasingly they live a world apart. 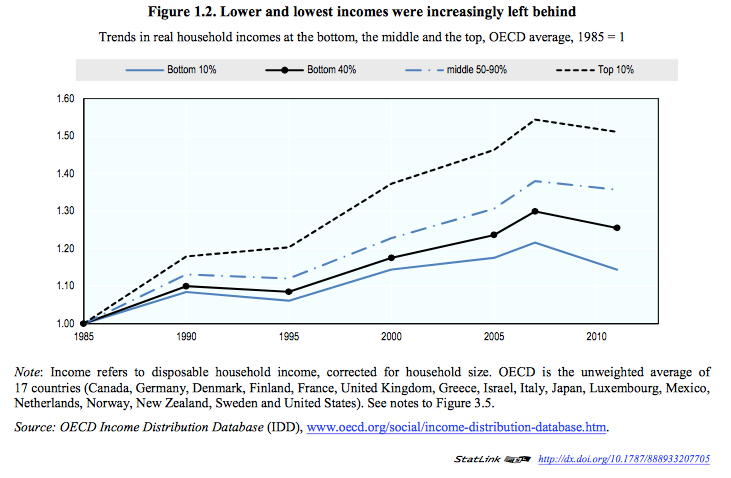 This entry was posted in Post Growth and tagged In It Together: Why Less Inequality Benefits All, income mobility, NBER, OECD. Bookmark the permalink.